Do you eat because you’re hungry or because the clock says it’s time to eat? Do you eat broccoli because everyone tells you too even though you find it hard to digest? 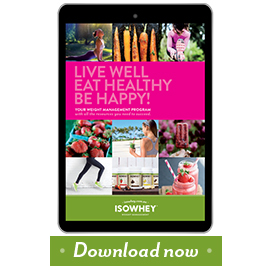 Everyone is different and no one body is the same, which is why sometimes a diet that works for your best friend won’t necessarily work for you. The key is to listen to your body, and figure out what makes YOU feel YOUR best. Low fat products are full of sugar. Once they take the fat out of a product it loses its flavour, texture and ability to satiate. To replace the fat they pump the product full of sugar, and there’s no quicker path to weight gain than filling up on the white stuff. Switch to the full-fat versions instead. The good fats will keep you fuller for longer so you’re less likely to need to eat again in a couple of hours and will provide you with a consistent slow burning source of energy, opposed to sugar which causes blood sugar levels to increase rapidly and then plummet just as swiftly. Greens are the most nutrient dense of the vegetable bunch. They’re great detoxifiers, high in fibre, low in calories and go with pretty much everything. I encourage my clients to squeeze them into every meal (including breakfast). If you’re not ready to eliminate some of the “junk” from your diet then the least you can do is start adding some nutrient-dense greens in. Diets don’t work. There is a mountain of evidence showing that even if people lose weight on a diet they will put it back on eventually. If you’re going to make changes by removing things from your diet then replace it with something healthy (and not necessarily food). For example if you eliminate your nightly bowl of ice cream (which you most likely eat for comfort) you’re going to feel deprived without it. Instead of feeling empty, replace it with a soul-nourishing herbal tea or better yet start a nightly journal practise. It’s about replacing the ‘comfort’ factor, NOT the ice-cream. Relax, I’m not talking about ‘that’ kind of gas. Guilt, Anxiety and Stress (GAS) are a food group all on their own and unfortunately are present at most meals we eat. For many people these overwhelming emotions can completely dominate how they process the food they eat. If your cortisol (the stress hormone) levels are raised while you’re trying to digest your food, your body goes into fat storage mode; so let go of the stress of eating the ‘right’ foods and concentrate on nourishing your body instead. GAS is the only food group I advocate the removal of, from EVERYONE’S diet. Blend coconut water, avocado, kale and baby spinach in a blender until pureed. Add remaining ingredients and blend until smooth. 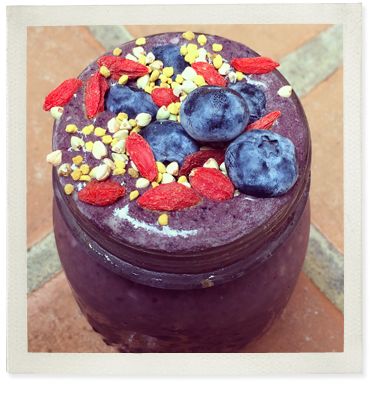 Pour into a mason jar or serving glass and garnish with gojis, bee pollen, buckwheat and extra blueberries. Jordanna Levin is a holistic wellness coach whose focus is to heal people’s 'complicated' relationship with food. She believes food should inspire and nourish, not be a source of stress and anxiety. 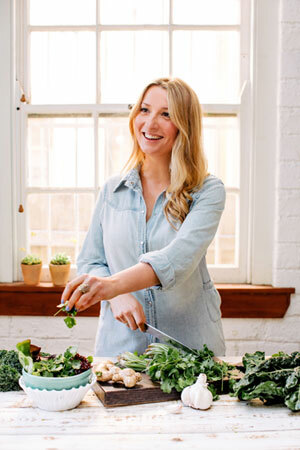 Through her coaching programs, cooking workshops and popular healthy food blog she’s creating a new movement of mindful and inspired eating.